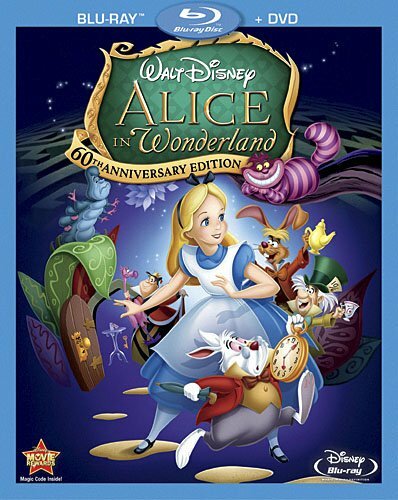 Neither my wife nor I found much fondness for Disney's 2010 live-action/CG Alice in Wonderland when we saw it in the theater, as despite the beauty of it and the coolness of the 3-D, we both found it to have quite a dull story. There was no drive to it, so we didn't care what was going on. Afterward, we wanted to see the 1951 animated version to compare, but never got around to it since it was pretty far down on our Netflix queue. Well, now the 60th anniversary edition is out on BluRay and DVD, and I was sent a review copy of the Blu-ray/DVD combo pack, so tonight we got to sit down and check it out. We start out in a grassy field or riverbank or something where young Alice is sitting on a tree branch while some lady reads to her. I thought the lady was a nanny or something, but apparently it was Alice's older sister. 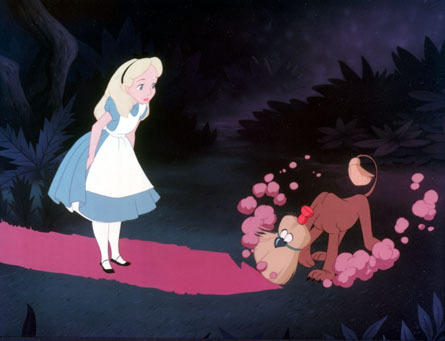 Anyway, Alice is bored and so when she sees a white rabbit that's wearing clothes and carrying a pocket watch, she decides to follow him, and winds up crawling into rabbit hole, where she appears to fall into some other dimension, eventually finding herself in a room with a tiny door with a doorknob that talks. The doorknob suggests that she drink the potion that's sitting on the table, and so she does, and is shrunk to a size that would allow her to fit through the door. But alas, the door is locked! There was no key on the table, but now there is, but she is too small to reach the top of the table. A box appears with some kind of cookie snack or something, so she takes a bite and grows way big, filling up the room. This causes her to freak out and cry, and her tears begin to fill the room. She then drinks more of the potion and shrinks down so tiny that she lands in the vial that she just drank from. Of course the door is still locked, but that problem no longer matters because the doorknob opens its keyhole-mouth and all the tear water and the floating vial with Alice inside flow through it. Wow, I mean seriously? How far are we into the and still we have no real plot other than Alice still wants to find the white rabbit so she can go to his party which she really doesn't even know he is having. All the rabbit really said is that he was late. And since he really seems to be freaking out about it, I would guess that he's late for some important meeting, not some casual party. Anyway, from here Alice continues on though wonderland meeting strange creatures for no real purpose. They don't seem to help her towards a goal, nor do they seem to help her learn about this world or about herself. So it seems that both movies seem to lack any real story. I'm kind of curious to know if the original book lacks a plot as well. 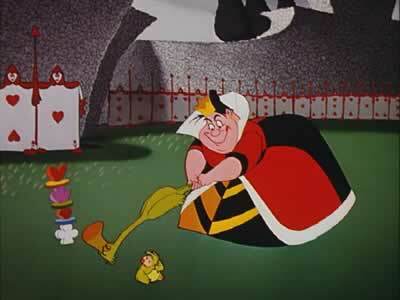 Is it just about Alice fumbling around in wonderland? Does she have goals? Does she learn lessons? At least this movie was only an hour and ten minutes long. The live-action version was one hour and forty-eight minutes! So yeah, I liked the classic animated version a lot more, but it still just isn't my cup of tea. Reflections On Alice - featurette about Walt Disney's attempts to bring Alice's Adentures In Wonderland to the big screen. I enjoyed this more than the movie ietset. Virtual Wonderland Party - live action choose-your-own adventure style thing with singing, dancing, jokes, and what not. There's also an option to just play it all the way through without having to select anything. Adventures In Wonderland Set Top Game - a game where you click on items on the screen in response to questions. 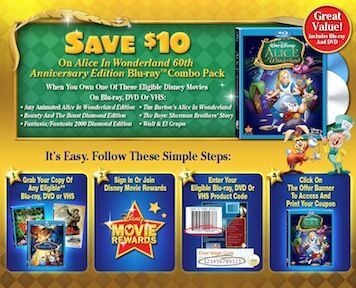 Through the Keyhole: A Companion's Guide to Wonderland - View the movie in this special mode and discover references to the original Lewis Carroll classic - introduced by the voice of Alice, Kathryn Beaumont.